Tencent, the makers of the most popular battle royale game PlayerUnknown’s BattleGrounds (PUBG) introduced PUBG Mobile Prime and Prime Plus subscriptions with the update 0.11.5. 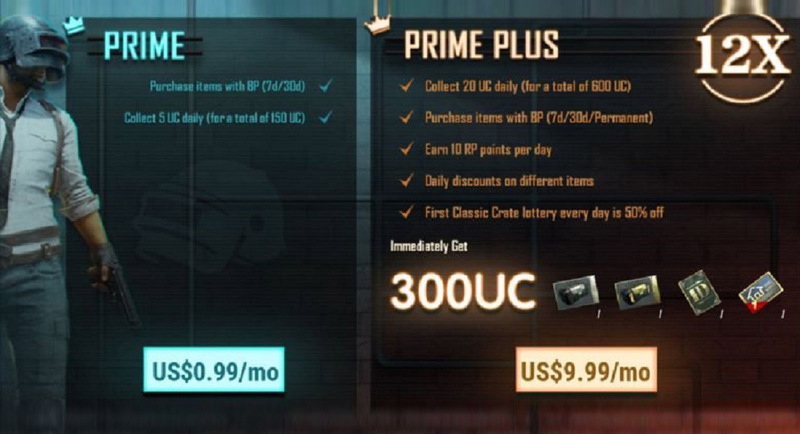 You can now avail daily Unknown Cash (UC), in-game discounts and can even purchase items with Battle Points (BP). The Prime and Prime Plus subscription are plans are available for both Android and iOS users. As far as pricing is concerned, I am still confused about the difference. For Android, the Prime and Prime Plus subscriptions are available at Rs. 85 and Rs. 400 per month. However, on iOS, the Prime plan is available for Rs. 79 and Prime Plus for Rs. 419 per month. After the first month, the Prime Plus will be available at Rs. Rs. 850 and Rs. 799 for Android and iOS respectively. Considering the prices of these subscriptions in the US, it’s found that PUBG has some other plans for India. The US PUBG mobile players will have to pay $0.99 for Prime and $4.99 for Prime Plus. After the first month, the Prime Plus will be available for $9.99. There’s no difference between Android and iOS players. Let’s have a look at what you get with UBG Mobile Prime and Prime Plus subscriptions. The company is rolling out the 0.11.5 update gradually with a hope to provide better gameplay experience, build stronger engagement and also having a new revenue source. But as per the sources, the development of 0.12.0 beta is already in progress. If you haven’t received the update yet, check out manually on your Android and iOS devices. The update is around 1.8GB in size for Android.